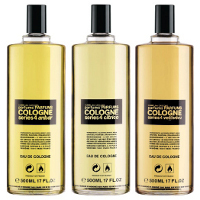 Comme des Garçons released Series 4: Cologne in 2002. Each of the three fragrances is a variation on the classic citrus-based cologne theme. Anbar is the Arabic word for amber, and the fragrance has notes of amber, mandarin, orange blossom, lavender, clove and musk. It starts with bright citrus notes, and settles quickly into a mild blend with a whisper of dry orange blossom over pale amber undertones. It has a touch of spice, but overall, it is more bright than dark. The lasting power is fine considering the strength, and it is nicely done, but for the moment I am not captivated so I am setting my sample aside for another try in the summer. Citrico is named for the Spanish word for citrus, and features bitter orange, bergamot, neroli, lemon, rosemary, orange blossom, rose, cedar and sandalwood. This is a nicely dry and zesty citrus with orange blossom and light woody undertones. If you need a citrus cologne splash, it is as good as any, but it has little to distinguish it from the many other fragrances of the same ilk. Layers nicely with the Vettiveru (see below). Vettiveru, after the Asian name for vetiver, has vetiver, bergamot, neroli, cardamom, white pepper, jasmine, white cedar and musk. The stand-out in this series, this starts out as a very peppery fresh green vetiver; the dry down is much earthier, slightly inky even, still fresh but with much less of a clean finish than my old friend Guerlain Vetiver. As with Anbar, the lasting power is better than you might expect, but it is a very subtle fragrance with minimal sillage — although bear in mind that I am trying this from a sample vial, and it is meant to be splashed on with abandon. I can see this one becoming a summer staple, and highly recommend that vetiver lovers give it a try. Overall, the series is less interesting than the Incense series released the same year, but all three of the fragrances are well done and would be perfect for the hottest summer days when a strong perfume is out of the question. To compensate for the cologne strength, they are packaged in gigantic 500 ml splash bottles. For buying information, see the listing for Comme des Garçons under Perfume Houses. I tried these at one point and was not that impressed. However, one of them was a nice, bright orange blossom. I do not remember whether it was Anbar or Citrico. I was curious about these, now I know they are nice but not exactly must haves. It actually makes me happy, what with the list of lemmings I have. V, I was not impressed with them on strips at Barneys, but on skin the Vettiveru is growing on me, and might turn out to be full bottle worthy in the summer. Always good to cross something else off the list, LOL! If these hadn't been CdGs I might have been more inclined to view them favorably, but since I was expecting (hoping for) something w/ an edge, I was shocked at how utterly lacking in character they were to my nose (and, yes, I admit I'm being prejudiced here and undoubtedly way to harsh just because I was hoping for something more CdGish). They are actually fairly pleasant (the Vettiveru is definitely my fav), but they're scents I'd only be interested in wearing to the gym or to the park in the summer. I know the Sweet series is usually thought to be something of an anomaly for CdG, but this actually seems to be even more of one to me. Totally agree that they are way more conventional than you would expect from CdG, and not sure why the sweet series was a bigger disappointment to me. Maybe because you could do a lot of interesting things with a sweet series, and they didn't? Cologne has fewer possibilities, I guess. Vettiveru I would place way above “gym-worthy” but I do know what you mean about the series in general. R, I was intimidated by those large bottles, so I never tested them. At the moment I can´t imagine to wear anything fresh (like e.g. orange blossoms) so I might test them when the weather gets warmer & can find a perfumery that sells them over here. S, they are definitely more summer than winter scents, but I don't always do my testing in the right season. This series is much harder to find than the others but if you run across them do give them a try, although they are hardly worth the bother on a scent strip because they are so light. R, the basic idea of these baffles me — applying this level of skill to reinventing something that, Lord knows, there's no shortage of. I'm not articulating this well: like they were coming up with a better Jean Nate or 4711 (overlapping with today's drugstore post! ), but why bother? 4711's still the ultimate cheap, wearable summer citrus cologne. My thoughts exactly…it's almost a relief to not HAVE to have something! M, no idea why they did these, but any of them are nicer & more sophisticated than what you'd find in a drugstore — but then, I don't much like 4711. But you're right, especially with the Citrico, you can probably do as well for cheaper. The Vettiveru, I would say no…there isn't anything like it in a drugstore, and personally I'd love to see in a regular EdP. Aw, M, hate to think of you drowning out there. Hope you get a nice, dry, sunny day soon! Hello dear R! Happy New Year! I must retest these soon. Excellent reviews as always. Hope you are well and that you have a magnificent year ahead. Thank you N, and of course wishing the same for you! Since I was able to sample more and more CdG products over the last few days, I definitely realised that their scents work really well for me. I'd be very much curious about that citrico! What fun — did you order a whole bunch of CdG samples? It's a great line. Not sure the Cologne series is the most “fun”, but they're really nicely done.